FIRST TIME CUSTOMERS: The MSO / MCO along with your "bill of sale" provided under your account log in and mailed to you with the MCO, will be used to take to your local DMV and your state will issue you an original state title. This is important to understand as we are not a title agency. We simply provide all documentation needed to register and receive a title in your state. For legality and documentation purpose we do not accept title/mco/mso requests by phone or regular e-mail. You must complete the request via the form below to log your request. We complete requests daily. If you did not receive a MCO/MSO with your order please complete the form below. MSO / MCO / Title requests is processed correctly will generally take 3-21 Business days to arrive. 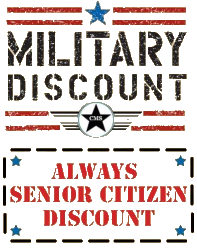 Please look for them via Certified USPS mail (signature delivery). There are generally blank mso | mco documents with the item when it arrives that should assist you until your original title arrives from your DMV. Please use your bill of sale until you receive your original documents from us. If you have ordered a unit from us you must complete this form below as soon as your unit arrives to receive your MSO / MCO / Title. This is a standard process by all vehicle sale companies. Once you have both your MSO and BILL OF SALE, simply take those two documents to your local DMV to complete registration if necessary and they will generate you the final, original TITLE. WARRANTY INFORMATION - Please note we track your warranty terms and length by your title request. Your warranty will not be approved if you have not first requested a mso via this form below. Off-road machines (atv, go karts and dirtbikes) are determined from the date of delivery. LOST OR STOLE MSO | TITLE: If you are an existing customer and are ordering a replacement title because it was lost, damaged or stolen there is a documentation charge for the cost of the legal mco CLICK HERE. HOW TO LOCATE YOUR VIN - Your VIN number is stamped or scribed on your new vehicle. Locations will vary depending on the unit you have. Below are some places to look as they all are different depending on your model. Some VIN's are harder to find and others are very easy. We do guarantee each unit will have a VIN. Please look in a well lit area as some frames are black and vins can also be black too. 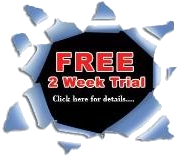 - Click here for detailed information on locating your VIN. We taken several pictures of our vehicles and where the VIN is most likely to appear. Click Here for help in finding your VIN. By completing an MSO request you will have stated you understand the terms on these pages and agree to them. 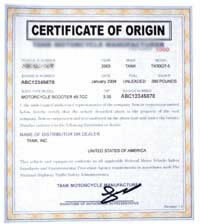 An MCO is a legal document that is issued by the MFG not by Countyimports.com . Thank you for your understanding and patience! BILL OF SALE: Will be automatically sent with each MSO to new customers. You can always print out your bill of sale by logging into your account. 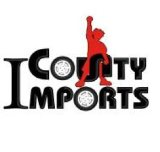 IF THE SITE IS NOT ALLOWING YOU TO UPLOAD YOUR INFORMATION, PLEASE EMAIL US AT salesdepartment@countyimports.com WITH ALL THE INFORMATION REQUESTED ABOVE, AND WE WILL PROCESS YOUR REQUEST. SORRY FOR THE INCONVENIENCE.